Jackie Pias Carlin lived on the island of Maui, Hawai`i until 2015 when she and her partner, David Barrett, decided to move to Carson City. Choosing to relocate nearer their grandchildren, Carson City was the best choice. 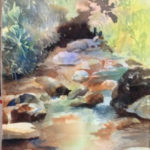 Her art in various mediums have been exhibited throughout Hawai`i since 1978, including the juried exhibits of Hawai`i Craftsmen and Art Maui. Carlin is one of the 32 artists featured in the book, Artists Of Maui, by SUMAC Publishing-1985. Her one-person art exhibits included hand-pulled serigraphs, woodblock prints, oils, pastels, and hand-painted silks. 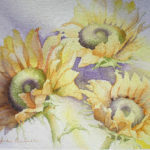 She chose to return to watercolors in 2012 after taking a refresher course in the same medium. 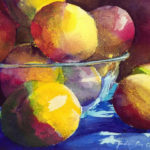 “I realized that the approach to watercolor had changed since I first practiced it in the 70s. Back then my instructor forbade photographs and maskit, and I could only paint en plein air and from live models. Now the medium is more relaxed. While attending a summer college program for a Masters in English, Carlin returned to Maui in 2002 and started workshops in memoir writing for active seniors at the Kaunoa Senior Center in Spreckelsville, Maui. In 2005, she authored Spirit Of The Village A Maui Memoir, a historic account of growing up in a sugarcane plantation village in the 50s. In 2015, she published a fiction, Aunty’s Place, a coming of age story with gender identity issues taking place in Kihei, Maui during the ’60s. She received her Masters in English at Bread Loaf School of English’s sister college, Lincoln College, Oxford University, England in 2004. In 2010, she was one of Maui’s women honored as Women Of Maui County-Writing Women Back In History. 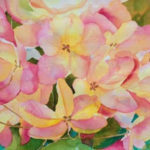 Prior to relocating, her art was represented by Hana Coast Gallery at the Hotel Hana Maui, and Waldorf Astoria’s Napua Art Gallery at the Grand Wailea Hotel, Maui, Hawai`i. Carlin is also a professional writing coach in memoirs, fiction, and self-publishing. She is currently writing a novel (between paintings and coaching) in the paranormal romance genre. Works of art and her blogs are at www.jackiepiascarlin.com. Books are on amazon.com. Friend her on FB and Instagram.